For those of us interested in the Boleyns, George Boleyn attended this Parliament from February 1533 to its close in April 1536, and was actively involved in the Reformation until his downfall at the beginning of the following month. On 6th March 1536, the Act for the Suppression (or Dissolution) of the Lesser Monasteries was introduced into the Reformation Parliament. This act affected the “lesser monasteries”, i.e. those with fewer than twelve members and those worth less than £200 per year. These religious houses were to be dissolved, their heads pensioned off and their members to become secularised or moved to larger monasteries “where they may be compelled to live religiously for reformation of their lives”. An Act whereby all Religious Houses of monks, canons, and nuns which may not dispend manors, lands, tenements, and hereditaments above the clear yearly value of £200 are given to the King’s Highness, his heirs and successors, for ever. said Church, to the only glory and honour of God and the total extirping and destruction of vice and sin, having knowledge that the premises be true, as well by the compts of his late visitations as by sundry credible informations, considering also that divers and great solemn monasteries of this realm wherein, thanks be to God, religion is right well kept and observed, be destitute of such full numbers of religious persons as they ought and may keep, hath thought good that a plain declaration should be made of the premises as well to the Lords spiritual and temporal as to other his loving subjects the Commons in this present Parliament assembled; whereupon the said Lords and Commons by a great deliberation finally be resolved that it is and shall be much more to the pleasure of Almighty God and for the honour of this his realm that the possessions of such spiritual religious houses, now being spent, spoiled, and wasted for increase and maintenance of sin, should be used and converted to better uses, and the unthrifty religious persons so spending the same to be compelled to reform their lives; And thereupon most humbly desire the King’s Highness that it may be enacted by authority of this present Parliament, that his Majesty shall have and enjoy to him and to his heirs for ever all and singular such monasteries, priories, and other religious houses of monks, canons, and nuns, of what kinds or diversities of habits, rules, or orders so ever they be called or named, which have not in lands and tenements, rents, tithes, portions, and other hereditaments, above the clear yearly value of two hundred pounds; And in like manner shall have and enjoy all the sites and circuits of every such religious houses, and all and singular the manors, granges, meses [messuages], lands, tenements, reversions, rents, services, tithes, pensions, portions, churches, chapels, advowsons, patronages, annuities, rights, entries, conditions, and other hereditaments appertaining or belonging to every such monastery, priory, or other religious house, not having as is aforesaid above the said clear yearly value of two hundred pounds, in as large and ample manner as the abbots, priors, abbesses, prioresses, or other governors of such monasteries, priories, and other religious houses now have or ought to have the same in the right of their houses; And that also his Highness shall have to him and to his heirs all and singular such monasteries, abbeys, and priories which, at any time within one year next afore the making of this Act, hath been given and granted to his Majesty by any abbot, prior, abbess, or prioress under their convent seals, or that otherwise hath been suppressed or dissolved; And all and singular the manors, lands, [etc.] … to the same monasteries, abbeys, and priories or to any of them appertaining or belonging; To have and to hold all and singular the premises with all their rights, profits, jurisdictions, and commodities, unto the King’s Majesty and to his heirs and assigns for ever, to do and use therewith his or their own wills to the pleasure of Almighty God and to the honour and profit of this realm. IV. Provided always and be it enacted that forasmuch as divers of the chief governors of such religious houses, determining the utter spoil and destruction of their houses, and dreading the suppressing thereof, for the maintenance of their detestable lives have lately fraudulently and craftily made feoffments, estates, gifts, grants, and leases under their convent seals, or suffered recoveries of their manors, lands, tenements, and hereditaments in fee simple, fee tail, for term of life or lives, or for years, or charged the same with rents or corrodies, to the great decay and diminution of their houses, that all such crafty and fraudulent recoveries, feoffments, estates, gifts, grants, and leases, and every of them, made by any of the said chief governors of such religious houses under the convent seals within one year next afore the making of this Act, shall be utterly void and of none effect.. . .
V. And it is also enacted by authority aforesaid, that the King’s Highness shall have and enjoy to his own proper use all the ornaments, jewels, goods, chattels, and debts which appertained to any of the chief governors of the said monasteries or religious houses in the right of their said monasteries or houses at the first day of March in the year of our Lord God 1535[— 6] or any time since, wheresoever and to whose possession soever they shall come or be found : Except only such beasts, grain, and woods, and such like other chattels and revenues, as have been sold in the said first day of March or since for the necessary or reasonable expenses or charges of any of the said monasteries or houses.. . .
VIII. In consideration of which premises to be had to his Highness and to his heirs as is aforesaid, his Majesty is pleased and contented of his most excellent charity to provide to every chief head and governor of every such religious house during their lives such yearly pensions or benefices as for their degrees and qualities shall be reasonable and convenient; wherein his Highness will have most tender respect to such of the said chief governors as well and truly conserve and keep the goods and ornaments of their houses to the use of his Majesty, without spoil, waste, or embezzling the same; And also his Majesty will ordain and provide that the convents of every such religious house shall have their capacities, if they will, to live honestly and virtuously abroad, and some convenient charity disposed to them toward their living, or else shall be committed to such honourable great monasteries of this realm wherein good religion is observed as shall be limited by his Highness, there to live religiously during their lives. IX. And it is ordained by authority aforesaid that the chief governors and convents of such honourable great monasteries shall take and accept into their houses from time to time such number of the persons of the said convents as shall be assigned and appointed by the King’s Highness, and keep them religiously during their lives within their said monasteries in like manner and form as the convents of such great monasteries be ordered and kept. XIII. Provided always that the King’s Highness, at any time after the making of this Act, may at his pleasure ordain and declare, by his letters patents under his great seal, that such of the said religious houses which his Highness shall not be disposed to have suppressed nor dissolved by authority of this Act shall still continue, remain, and be in the same body corporate and in the said essential estate, quality, and condition, as well in possessions as otherwise, as they were afore the making of this Act, without any suppression or dissolution thereof or any part of the same by authority of this Act. . . .
King’s Highness for every month so offending £6. 13s. 4d. to be recovered to his use in any of his Courts of Record. 27 Henr. VIII, c. 28: Statutes of the Realm, iii, 575. Cherry, Clare and Ridgway, Claire (2014) George Boleyn: Tudor Poet, Courtier and Diplomat, Chapter 11: The Reformation Parliament (1529-1536). The text of the act is taken from ed. Tanner, J. R. (1922) Tudor constitutional documents, A.D. 1485-1603, Cambridge University Press, p. 58-63. This can be read online at https://archive.org/stream/cu31924030504322#page/n85/mode/2up. Never knew that ‘vicious’ had a definition of – having the nature or quality of immorality; depraved, grossly immoral! The above is a bit of a read and I got side-tracked again. Yes, quite a read! I’m sure they could have summed it up in a few lines! Yes Catherine Howard was accused of having a vicious life prior to her marriage with the King, we today define the word as some one who has committed really terrible acts, some one who is very cruel and without pity, yet in Tudor times it merely meant immoral behaviour, it was well known that some monks did indulge in immoral behaviour, openly lived with their mistresses and was often ‘in their cups’ as the Tudors were wont to say, the great Cardinal Wolsley himself was guilty of drunken behaviour and, very demeaning for some one of his high office, was often put in the stocks because of it, he also had a mistress and therefore we can say these monks of the ‘holy order’ were not the paragons of Christian behaviour that many were led to believe, yet the monks did provide food and shelter for the poor sick and homeless seeking alms, from a cultural viewpoint it is a shame the monasteries were destroyed as many important tombs were lost in the process, Henry 1sts tomb for one and the beautiful gold and silver works of art they possessed were sold off or lost, Henry garnered much wealth from the sacking of these religious houses yet a lot of treasured manuscripts were lost in the process, Worcester Cathedral housed an impressive library of six hundred books and after its destruction, only six remained, some valuable music sheets were also lost in the process and have never been found, the abbey at Lincolnshire was razed to the ground and although many were rebuilt there are some that were just left to decay and all around the country now you can see evidence of the destruction in the sad ruins these once proud houses were, at twilight the moon filters through the holes that were once beautiful arched windows and moss clings to the crumbling stone and crawls over the the barely visible floor where once hundreds of feet walked on their way to prayer, you can hear the faint tolling of the bells as they called the monks and nuns to matins and vespers and see them wandering around the once prettily ordered gardens weeding and planting the herbs and vegetables that later they would put in stews and pies, it is a different world now but when I see these old ruins I feel like I have gone back in time and see them living again in all their glory. Henry Viii had one motive only in the Dissolution of the Monasteries….greed. He wasn’t interested in reforming them, because he would have done. The smaller monasteries were the test cases. He had the monks moved to larger houses but he probably still got a bit of money from them. The wealth of these smaller houses did not lie in the order or physical wealth as actually most of them had very little. It lay in the lead on the roof, worth a fortune, the land and the privileges associated with each order. Payment for wool production, for example…as the brothers were self sufficient. The bigger monasteries brought the best prizes, but they were not dissolved until after the Pilgrimage of Grace. However, these larger houses were involved in a whole range of lucrative businesses, plus payments of various kinds….it’s these as well as their estates, farms and lands as well as structures that made them wealthy targets. I have no doubt that in a few cases, the litany of charges Cromwells henchmen listed against the monks may have been true, but I don’t accept that the majority were. The song is the same at every house, a tick list of moral dishonesty and fraud. A tick list that is uniform is unlikely to be true. There is evidence that in fact most monks lived honest, hardworking, morally good lives….many bones show malnutrition. If their bones show a different story, the henchmen lied. The Dissolution was viewed with horror by most people, even those who criticized the monastic life, questioned the wholescale closures. This was a savage attack on a 1000 years traditional way of life. There were ways to reform without this direct attack. Reform of the Monasteries in Spain had been achieved by Isabella with care and skill and was effective. Orders had reformed themselves over the years with stricter rules. Sorry, but this was a money raising exercise for the crown, pure and simple. The Dissolution also caused the Tudor Government a huge social headache. Along with the Monasteries schools and hospitals closed. Farms ran by the monks vanished and people were left homeless. Local industries dependent on the religious orders also suffered. Bridges and ditches, roads, all had been maintained by local monks. Henry and Cromwell were inundated by community leaders petitioning for remedies and as a result by 1539 urgent action was needed. New schools had to be founded or refounded, Cromwell had to devise measures of poor relief and thousands of able bodied men were ‘encouraged ‘ to move and work in the iron and bronze smealding business, now being expanded for the production of land canon, a result of Henry’s divorce and religious changes, needed in case of defence against France or Spain. The Privy Council was also reformed in order to meet daily and resolve real economic problems. The nobility and gentry were also forced to step up and form country wide county commissions to look at roads, waterways, carriageways, sewage, housing, and much more. The taxation rights of the Church and Monasteries also transferred to the Crown. Fees for services, farming rights, first fruits, many other traditional local payments became the privilege of the Crown. We think we are overburdened with taxation today…our Government has nothing on the financial resourcefulness of the Tudors. It’s very ironic, however, that even with all of this wealth, that by the end of Henry’s reign the Treasury was almost empty. 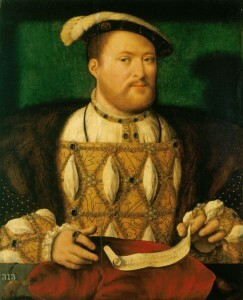 Henry Viii was what you may call a compulsive shopper…he knew how to spend money and spend big. He had already spent his inheritance, probably three times over, his personal fortune left his daughters rich and well off, but the money used in the economy was devalued. He built ships and numerous palaces and he was repeating this in 1538 with the magnificent Nonsuch Palace. The money Henry spent on coastal and border defences became obsessive. Tapestries, books, libraries, jewellery and magnificent clothing, money on his fruitless war with France, paintings, entertainment and his determination to have the best court in Europe, not to mention the huge sums spent on his wives…especially Katherine Howard…most of this came from the transfer of revenue from the Monasteries and other Church institutions to the Crown. I am afraid I don’t know the figures, but I have heard it said that the revenue and new taxes brought Henry Viii and his Government billions in today’s money. Henry inherited a nation that was prosperous, financially solvent, and generally in pretty fair shape. He left the nation virtually bankrupt, currency devalued, the economy in a shambles. The Dissolution caused great pain to the people, and great gain to Henry. It also finished Anne. no chances-it is no coincidence that she was in the Tower in less than two months after the bill. It is also no coincidence that this was the straw that broke the camel’s back with Rome. Money makes the world go round.